Group members: David Makepeace, Doug Young, Keith Lyons, Phil Schedlbauer, Judy Toner, Jeff Dorfman, Tony Turbee and Connie Frisbee Houde. It was my pleasure to return to The Mataderos Tribe and our clinic in La Laguna after a year and a half away. Our group of 8 consisted of veterans, except for first-timer Tony, who had no trouble adapting to the hardships of the trip and accommodations and left us all hoping he returns soon. Because of our loss of a coordinator last year, one of our main goals was to further train and integrate our replacement, local resident and long time friend and supporter of NY/HELP’s mission in the tribe, Joel Ramírez. Furthermore, because we had a seasoned construction crew in Phil, Keith and Doug, we had a host of projects planned and funded. Judy, as usual, had assembled quantities of educational materials for the schools and looked forward to delivering them as well as doing some painting at the clinic and the Tribal Communal Center. Our chief photographer and sewing expert, Connie, in addition to documenting the trip, hoped to rally the women to further their sewing efforts. Tony wasn’t sure what to expect but had a great attitude and a variety of skills. We were met at the airport by our driver, Mario, who took us to Yoro. 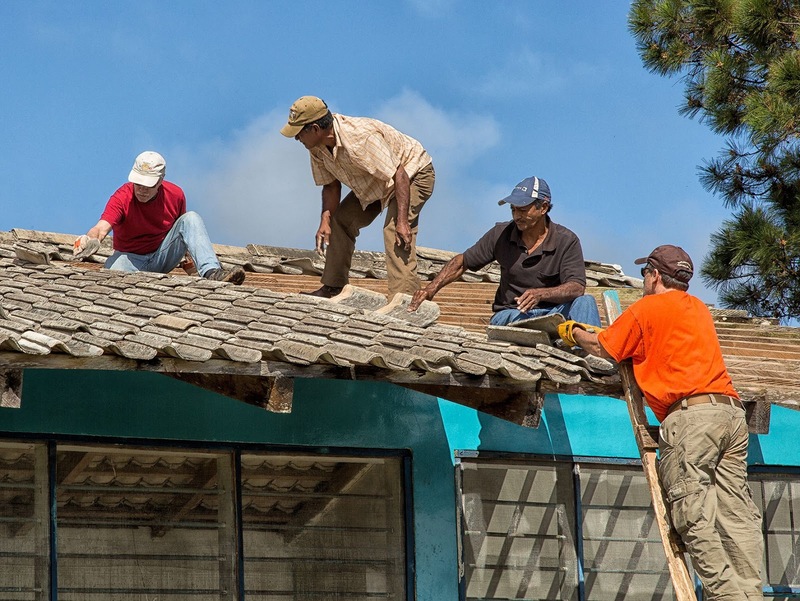 There we were met by our coordinator, Joel, and, after loading up on supplies in and checking in on Petronida and José Feliciano in the boarding house we used to support there, we made the trip up the mountain in two shifts. Everyone in the village was delighted to see us, as always, and we quickly settled in at the clinic and planned our activities. 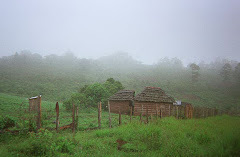 Because we had not been to Carrizal in awhile, the Tribal Council decided to send us there. We stayed in the elementary school and worked from there. Thanks to the efforts of our coordinator, Joel and Amado, the President of the Tribal Council, we had materials in place for our planned construction projects. We were able to build three homes (post and beam and tin roofs) and put stucco on the kindergarten, which was built by the last group. We bought cement for the floor, which has since been completed. The residents of this village treated us like royalty and provided all the labor we needed for the projects. Our American crew was especially impressed by the smiling “gung-ho” attitude of their Honduran counterparts. We were very lucky to have Jeff Dorfman along to set up all the lighting and other portable technology that made our stay more comfortable than otherwise would have been the case. 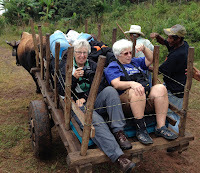 Judy and others not up to the 2 hour walk back to the clinic were treated to an ox cart ride. Judy, who garnered the nickname, “Reina de la Patastillo” (Squash plant Queen), was quite a sight atop the ox cart. Back in La Laguna the teams were very productive. 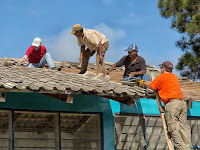 In addition to putting a new roof on the La Laguna school and building 2 stoves in Mataderos, we were able to repaint the kitchen and the outside and inside of the Tribal Communal Center in Mataderos. We ran out of time for the two latrines planned and funded in El Calichal but recently learned from our coordinator, Joel, that they have been completed. Connie’s energy is invaluable as she tries to organize the sewing group. I translated a meeting between her and Araceli, head of the sewers in which we made some plans including classes for young girls and trying to sew things that can be used or sold. This will involve finding more treadle machines, but Connie and I are very excited about the possibilities. Connie also took some amazing picture as usual. It was great to see Mirtila again! The clinic was well stocked, as Dr. Comstock keeps a special eye out to make sure medicines are always available. As always, there was a constant flow of patients, and the grounds played host to many children who are always interested in how the “gringos” pass their time. Thanks to Keith, there were soccer balls and cleats to go around. When we returned to San Pedro we were able to fill Mirtila’s medicine wish list which Joel carried back to the village. As always, Judy Toner, our staunchest education supporter, made sure the wish lists of the local teachers were filled with the myriad supplied we carried down with us from the States or bought locally. She and Tony and Connie spent an entire day making up 6 sacks for delivery to 6 villages on her list. Camille Makepeace, who maintains a pen-pal program with a school in Las Brisas, sent down materials made by Livonia students along with letters and pictures. 1. I made it clear that Joel was our voice in the tribe. 2. We discussed the setback caused by our loss of a coordinator. This led to not being able to reach some goals such as starting a Study-at-home program in Agua Blanca. This led to talk about looking for a suitable place in the lower villages to build another Centro Básico. 3. Amado Castro, President, described a program whereby Ladinos (mixed blood people living outside the tribe), in exchange for having used land belonging to the tribe in the past, want to provide assistance to 11 villages. To receive this assistance, the tribe must first establish its boundaries. Keith Lyons is helping with that process by mapping with the help of SUNY Geneseo equipment. More to follow. 4. We spent a lot of time solving some issues with the purchase of materials for our work projects. 5. We spoke a lot about the scholarship program which I am trying to reorganize to provide continuity. 6. They are looking forward to Dr. Comstock’s visit in July. 7. Lauro Martínez has suggested that the water source he uses would work for the village of La Laguna. This idea is worth exploring but would require a major effort and expense.